Dust. It’s the stuff of earth. Dust. It clings to everything. Dust. Even though it’s small, it can kill. Many of us have heard of the Dust Bowl years here in this country. A time when crops failed and cattle died and people picked up stakes to try to find somewhere else to live. We may have read of or seen the movie featuring the Joad family in John Steinbeck’s “The Grapes of Wrath” as they struggled with dust. Hear a first person account from Australia by Neryl McCallum who lived through similar conditions. It was a time of immense dust storms. Day after day as the wind blew in from the west, it picked up topsoil from hundreds of kilometers of bone dry land and deposited it on top of our house. Of course, not just our house, on everything that lay in the wind’s way. Some days the dust formed clouds as thick as fog and we watched these dust clouds roll in across our farm just as one might watch storm clouds rolling in from the sea. I’ve always taken solace in this story about “shaking off the dust” found in the gospels of Matthew, Luke, and Mark. It gives us permission to stop beating our heads against the wall of unwelcome. It prioritizes keeping moving, working with people who do want to hear about the love and grace of God. And sometimes it just feels good to say, “Bah”—you didn’t want me, I shake even the dust of your ground off my feet as a testament against you. What made the people who knew Jesus so well unable to hear God’s word from him, unable to be healed through him, unable to see God in him? Was it that they thought they knew him? They knew what side of the tracks he had been born on. They knew his family, his brothers and sisters. They knew what kind of schooling he had had. They remembered what he’d been like as a child, a teen-ager, a young adult. Had they had placed him in categories, as we all do? And did those categories kept them from seeing clearly, from being open to what was actually happening? And I had this flash. What if the way we think about people, the categories we place them in, the prejudices we might not even know we have—what if all that is like dust. It covers everything. It gets into the smallest cracks. It settles on our eyes, and in our ears, and around our hearts. It blows up our noses, and taints what comes out of our mouths. It infiltrates our very being, our very life. Dust. The source of life—if it is mixed with water and made into mud and infused with the breath of God. But Dust by itself—covers and suffocates and eventually kills. We should want to shake off the dust of everything that is not welcoming to God’s word of healing and grace. I can’t fully describe the joy we felt when the rain finally came and the drought broke. The rain set in for a couple of days, and each morning my mother stood on the verandah sipping her morning cuppa and watching as the rain soaked into the earth and puddles formed. One morning, she put down her cup and gathered my sister, brother, and me into the house and set us about cleaning. My job was to dust and vacuum the living room. The pride of this room was a large mirror that hung formally on a wall above a china cabinet, so after I’d dusted the shelves and vacuumed the floor, I stood on a chair and swished a soft cloth over the glass to clean it. I’d thought the mirror was reasonably clean, but soon my cloth was covered with fine particles of that damned dust and it took me several times before the cloth came away from the glass clear. As I stepped down from the chair and perused my handiwork, I couldn’t help but notice how the light in the room had changed, ornaments shone and glassware sparkled – things looked very different now the dust was wiped away. The same thing had happened outside, the leaves on the trees were greener and the corrugated iron of the sheds had a sparkle that had long been missing. It was like a heavy, dull blanket had been lifted off of everything. So how do we brush off the dust? How do we shake off the stuff that may cover over the true nature of people and our world? Is it a one-time shake? Or is it more like housecleaning—you have to do “heavy-duty spring cleaning” but then you also have to supplement with week by week touch-ups? Of course, the rain, the water image reminds me of baptism, and of our weekly pouring of water into that baptismal bowl, reminding us of God’s love raining down on us, reminding us of the cleansing power of God’s grace, reminding us that we are washed, into each pore, into every crevice, into our minds, and hearts, and souls. That is one way that we can brush off the dust. But it seems to me that there has to be more participation—that we have work to do, to make sure we can enjoy the sparkle of God’s glorious creatures and creation. And that’s where St. Francis’ prayer came to my mind. We all know what this world can be like. We know there is hatred and injury and doubt. We know there is despair, darkness, and sadness. That is the dust of life. It invades and threatens to undo us. What can we do to brush off that dust? We work at making ourselves a channel of God’s peace. We fend off hatred with love. We soothe injury with pardon. We stand up against doubt with faith in God’s promises. What do we do to brush off that dust? We counter despair with hope. 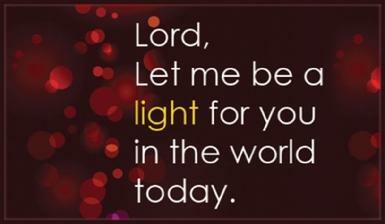 We bring God’s light to lighten every corner of darkness. We balance sadness with joy. And then in the second part of the prayer, we are reminded that we have a choice—in this dust-busting business. We can choose to console rather than be consoled, to understand more than to be understood, to love regardless of whether we are loved. It is the “good fight,” and we are warriors of good versus evil. It is not something that will just happen, it is something we have to consciously work at. And why do we do it? What do we get from brushing off the dust? Why do we have to constantly have to be in motion? In a funny way, there is a cycle, a circle, and we are part of it. So, in pardoning we are pardoned, in giving we actually receive, and in dying we are born to eternal life. One other thought I had this week: Maybe brushing the dust off our feet is also a way of recognizing that it is not all about us. We haven’t been elected the savior of anyone. We are just the messengers. We are sent out, to witness: to love, to grace, to healing, to wholeness. But even if we brush off the dust, even if we move on to the next challenge, the words remain, the grace remains, God’s promises are ever sure. Who is to say—maybe we are to be those who sow rather than those who reap. And once we have sown, we need to get out of the way. For it is God who sends the rain and the sun and the breeze and eventually will bring in the harvest. So let us go about our calling—as we too are sent into the world. --We are to tell the world about God’s love. --We are to fight with the demonic forces everywhere. --We are to work at brushing off ALL the dust. --We are to sprinkle the oil of healing on everything! --We are to do our little part for the kingdom. May God be with us always on the journey. Alleluia.